MAX Falcon-20 RGB custom programmable mini 20-key keyboard/keypad/Macropad. 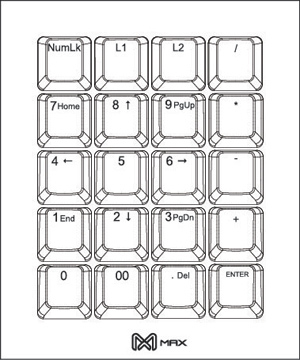 Each key allows you to reprogram and use it as numeric keypad or even dedicated shortcut keys. With our simple and easy programming app, you can now create your own macros / media keys and combination keys without any coding experience to increase your daily productivity. Been looking for one of these for years. The best I could find was an X-Keys Custom Keypad. But this didn't come with mechanical switches. It did the job for a while until I found this. Mechanical switches are some much nicer to use. Only negative is that there was a lack of keycaps to fully customise my order. Otherwise I'd give 5 stars. This is a wonderful product. I really enjoy the ability to rotate the device. I play driving games with a VR headset on so need something that feels familiar. I got this bad boy with custom caps for Zbrush sculpting on a tablet. Its perfect. This Keypad is amazing. The backlight is bright and the programming software is pretty good. Great addition to my tenkeyless setup for the times I need some extra macro keys. When my assembled Falcon-20 keypad arrived I immediately applied the custom colored and translucent keycaps I also bought from Max Keyboard. Then using the excellent and easy to use set-up software I added in the keybindings and RGB color schemes for my various video games. AMAZING!!! First of all, this product is rock solid - with a sturdy metal frame for supporting the (in my case) Cherry MX Browns with O-rings. I'm using it in "landscape" format which offers 5 keys wide and 4 keys down - perfect for creating a customized WASD layout with plenty of side and bottom buttons for full keybindings. Now, instead of looking down at my keyboard hunting for oddly placed keys, the Falcon-20 makes it natural (and fast) to locate those keys without looking. Thank you so very much for bringing to the gamers a product badly needed, in a build that is bullet-proof, and at a cost that makes it a no-brainer.